We adopted Sam and Emma shortly before Christmas in 2007, two weeks after our cat Templeton died. We were her third home, her previous family had adopted her as a kitten but a year later felt they had too many cats and had been unable to find a home for her. I took this picture of Emma two days later on Christmas Eve after she joined Sam in quarantine in our guest bedroom. Initially we kept them in separate rooms until their health tests came back, but Emma was pretty miserable in isolation and it was a relief when she could join her new little brother and they could keep each other company while still being kept separate from our cat Scout. With Templeton and Scout, my heart was open to loving a new cat before it was finished breaking for the departed one, and so it is with Emma. We went to the Oregon Humane Society this morning to look at some of the younger cats, as Boo could use a playmate. The young kittens got adopted right before we got there but we had a chance to meet a sweet young cat that we are considering, though we have some concerns she might be a bit too shy. An outgoing young cat came up for adoption after we were there that we will meet in the morning, but perhaps she will be too much for Boo (and especially Sam). It’s so hard to know. After all Boo was a terrified little thing who shook like a leaf when we met him, yet you’d never know it now by watching the confident little fellow who is taking over the household, despite being the youngest by far. There’s no rush. Whoever we adopt will come to a good home, we just hope it’s the right one. 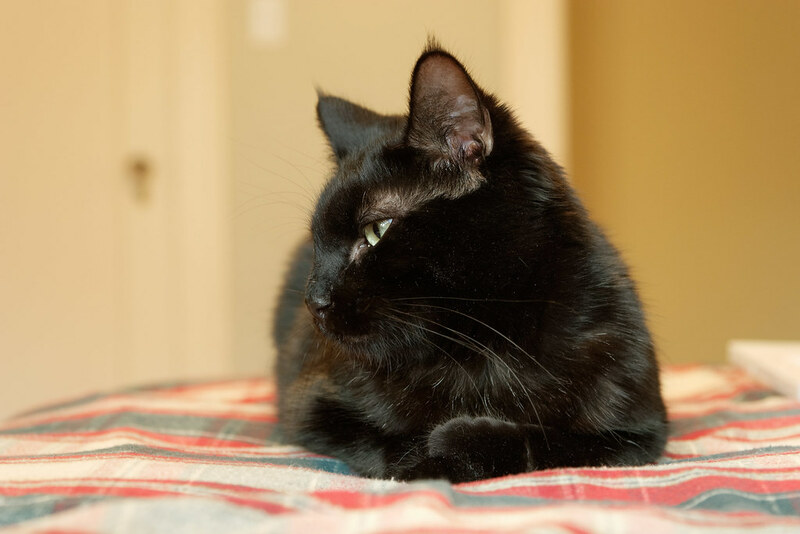 This entry was posted in Pets and tagged black cat, cat, Emma. Bookmark the permalink. The cats on our ‘maybe’ list all got adopted late yesterday but we’ll keep looking. They have found the best home with you! Most of our pets found us and some we found homeless and needing shelter. Some shy at first, but eventually coming around as they learn to relax to open arms just waiting to love them! Great post! Thanks! They’ve all been great, each in their own way, and have blessed our lives so much.